A private beach property located in Malapascua Island, Tepanee Beach Resort serves as a tranquil tropical island getaway as... Peace and quiet and utmost privacy await visitors at Tepanee Beach Resort, a resort in Cebu that is truly "away from it all." Plunge into the waters of Malapascua and enjoy a breathtaking view of its colorful marine life. While you're at it, enjoy a comfortable stay at the Purple Snapper Dive Resort—possibly one of the best places to stay at when on the island. Malapascua ... Plunge into the waters of Malapascua and enjoy a breathtaking view of its colorful marine life. While you're at it, enjoy a comfortable stay at the Purple Snapper Dive Resort—possibly one of the best places to stay at when on the island. Malapascua is located just off the northernmost tip of Cebu, but don't fret since getting there is easy. You can ride a Maya-bound bus from Cebu City, which would take around 3 to 4 hours, depending on the traffic and weather. From Maya, you will then have to ride an outrigger pump boat, which will take you directly to the island. The resort is just a stone's throw away from the Logon, where the boat will dock. Purple Snapper Dive Resort features native yet sturdy accommodations, with each room exuding a cozy and homey ambiance. Whether you choose a fan room or an air conditioned room, you will surely find them relaxing and comfortable enough for a much-needed rest. Although sparsely decorated, the rooms are fitted with practical amenities including private bathrooms with hot and cold showers. Hippocampus Beach and Dive Resort is found at Bounty Beach Logon, Malapascua Island, Daan Bantayan, Cebu. It's a beautiful resort with its rooms integrated into a natural tropical garden with coconut and various flowering trees, ferns and orchids. Ro... Hippocampus Beach and Dive Resort is found at Bounty Beach Logon, Malapascua Island, Daan Bantayan, Cebu. It's a beautiful resort with its rooms integrated into a natural tropical garden with coconut and various flowering trees, ferns and orchids. Rooms have a European style private bath and a large roofed veranda that has a view of the garden and the sea. The resort has free WiFi Internet access in public areas, child-friendly facilities, a garden, coffee shop, library, barbeque facilities, restaurant, a bar, a generator, and a smoking area. They also have a variety of services that they offer, including airport transfers, tours, laundry service, babysitting, massage service, currency exchange, luggage storage, giving morning calls to guests who need a reminder to wake up early, room service, and cleaning service. Hippocampus Beach and Dive Resort's rooms each have a comfortable bed with clean linens, air-conditioning, cable television, and WiFi Internet access. The private toilet and bath has hot and cold water, a shower, towels, and toiletries. It is located 3 hours and 30 minutes away from Mactan Cebu International Airport. The hotel is accessible via regular public transport route. Interesting and fun places to visit near the resort are Evolution Diving, French Kiss Divers, Little Mermaid Dive Resort, Amihan, The Craic House, Ging-Ging's Restaurant and Flower Garden. Evolution Dive and Beach Resort is located on Malapascua Island, the northernmost tip of the province of Ce... Take that much-needed break from the city's hustle and bustle and enjoy the sun, sand, and sea right here at Evolution Dive and Beach Resort. Malapascua is a tiny island located in the northernmost part of the island of Cebu. Everything expected from an isolated piece of land in an archipelago can be found in Malapascua—a coastal scenery of flour-soft sand, clean turquoise sea, and rustling coconut trees, while its waters are rich with underwater treasures. Its wonderful marine life makes Malapascua one of the best diving destinations in the Philippines. Among the dive sites in Malapascua, Monad Shoal is the most popular. Divers arrive early in the area to catch a glimpse of the long-tailed thresher sharks. These sea creatures are seen rarely in other countries, but they are more common in Monad Shoal. Aside from thresher sharks, the underwater world in Monad Shoal is also teeming with enormous manta rays. Gato Island is another amazing dive site in Malapascua, where divers can enjoy feasting their eyes on amazing animals like black and white sea snakes, eels, frog fish, and sea horses. Divers can also explore its underwater caves and catch a glimpse of different kinds of sharks while they are sleeping. Corals and various underwater rock formations are other wonderful sights to behold in Gato Island. Meanwhile, the Lighthouse Reef dive spot offers divers a view of the rare mandarinfish. The brightly colored sea creature is commonly seen during sunset. Divers can also get the chance to see the mandarinrish perform its "mating dance." Also in the area is a wreck of a World War II Japanese landing craft which now acts as a home for various sea creatures. 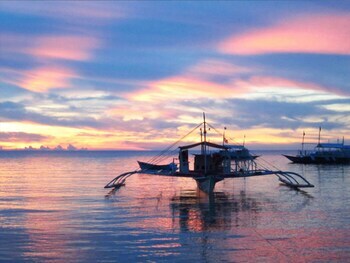 The island of Malapascua is located at the northernmost section of the province of Cebu. There is no direct way to the island. Instead, travelers need to travel by air, land, and sea to get there. The most convenient way to get to the island is to fly first to Cebu City, which will land at Mactan – Cebu International Airport, located about 150 kilometers south of Malapascua. This airport serves all flights coming in from the major cities in the Philippines, including Manila. There are also flights coming from the US, China, South Korea, Singapore, Taiwan, Malaysia, Japan, and Hong Kong that are served at the airport too. On average, the flight time from Manila to Cebu takes about one hour and 20 minutes. Sea travel (via 2GO Travel, Philippine Span Asia, Weesam, Oceanjet, and Cokaliong among others) is also possible but consumes a huge chunk of time, usually half a day to a full 24 hours. Once you arrive in Cebu City, find your way to the North Bus Terminal. Take a bus (vans are also available), heading for the town of Maya, which is about four hours away. After that, proceed to Maya Port and take 30-minute ferry ride to Malapascua. Take note that the last boat leaves Maya Port at around 5:30 PM. If you happen to arrive at the port late in the day and some boatmen tell you that you need to pay more than the regular fare, don’t believe them. Roaming around Malapascua is possible with motorbikes, also known as habal-habal. You can also rent a motorcycle for the day if you wish to tour the island at your own pace. Renting a bicycle is also possible. Over the years, the island of Malapascua has continuously gathered a steady stream of tourists, both local and foreign, who are drawn to its natural beauty. The island is home to white sand beaches, azure and crystal clear waters, and fascinating marine life that will surely captivate the attention of even the most discerning of tourists. The coast of Malapascua is ideal for a calming walk. It is a long stretch of gorgeous white sand which you can walk from one end to the other in three hours or less. You can take selfies with your barkada along the way, or snap charming photos of its seascape. But there is more to the island than its pristine shores. The bulk of travelers who visit the island are there for one thing: diving! And if you’re in Malapascua for its breathtaking underwater world, there’s no other place to see it than Monad Shoal. It is one of the top diving spots in the entire Asia Pacific. It is also said that it is the only dive site in the country where you can swim alongside elusive thresher sharks. If you’re lucky, you may also see manta rays, devil rays, eagle rays, and hammerhead sharks when you go diving at Monad Shoal. Gato Island is also another famous spot amongst divers and marine enthusiasts. The island is a marine sanctuary and home to at least five dive sites with stunning marine ecosystems. Sea snakes, cuttlefish, seahorses, porcupine fish, and frogfish are just some of the amazing sea creatures you’ll see when you explore these areas. Gato Island is also a haven for underwater photographers because of the colorful coral gardens around. If you’re into wreck diving, Malapascua has quite a few attractions up its sleeves, ranging from beginner dives to the more advanced. The lighthouse wreck features a Japanese World War II landing craft. It is the ideal site for beginners since the ship is submerged in very shallow waters, only about five meters deep. There is also the wreck of Doña Marilyn, a passenger ferry that sank during a typhoon in 1988. The ship is covered in soft corals and has abundant marine life composed of nudibranches, flatworms, cuttlefish, and moray eels. For the more qualified divers, you can actually enter the ship and explore the ruins from the inside. If you’re a technical driver raring for a one-of-a-kind underwater adventure, then the Pioneer Wreck is recommended for you. It is located about 42 to 54 meters below sea level and is teeming with numerous schools of fishes. For those who wish to snorkel, you can try the shallow waters at Dakit Dakit Island, which has its own amazing coral gardens. But for some beach bumming, then Bounty Beach is the place to be. The beach is also the perfect spot where you can enjoy the splendor of the golden sun especially when it goes down at the end of the day. Another exciting activity to do in Malapascua is cliff diving. The island has a 50-foot cliff with the ocean below. It’s the perfect opportunity for those who want to conquer their fear of heights. If time still permits, go on a side trip to the islands of Carnasa and Calanggaman. These islands boast picture-perfect white sand beaches away from the crowd. If you want to know how it feels like to have your own piece of paradise, a trip to these islands is highly recommended. Every May, the whole island is decked in colorful decorations and filled with a jubilant atmosphere as it celebrates the annual Lawihan Festival. The festival was established in 2009 to honor the thresher sharks (lawi in local dialect), one of the island’s main attractions, and the island’s patron, Saint Birhen delos Desamparados. The dance competition, which showcases the culture and tradition of the locals, is the highlight of the festival. There are quite a number of restaurants available on the island that serves different kinds of cuisines to satisfy even the most discerning of all appetites. For starters, Ging-Ging’s Garden Restaurant is a favorite among those who visit the island regularly. Not only do they serve delicious vegetarian and curry dishes, but their meals are highly affordable as well. Prices start at only PHP 60.00! Ristorante Angelina is yet another favorite food spot on the island. It serves sumptuous pastas and pizzas if you’re craving for your favorite Italian dishes. In addition to its great food, the restaurant is located on a beachfront so you can dine while admiring the beachscape. And then, there is Kiwi Bakhaw, a quaint and isolated dining establishment where you can some incredible creations from a chef. It is recommended to order in advance since the place is always packed with customers and it may take a while for your food to arrive. But the wait is guaranteed to be worth it. For those who crave for seafood and Mediterranean fares, you can try Amihan Restaurant. It stands on a hill, treating its guests to an overlooking view of Poblacion Beach. And with the great view comes the delectable food: they have fish in white wine and lemon butter sauce and even black risotto. Vegetarians will also enjoy this place because of their selection of vegetable dishes. Of course, dining in Malapascua won’t be complete without trying authentic Filipino food. Check out Mabuhay Restaurant which serves an incredible crispy pata along with dishes made from fresh seafood. Prices start at only PHP 95.00. Malapascua Exotic Bar & Restaurant also serves amazing international and local dishes. After dinner, you can stay behind and sit at the bar to enjoy some cocktails or beer. The selection of cocktails at Oscar’s Bar and Restaurant are also worth checking out. Other places to visit for a drink or two while listening to great music include The Chiringuito Bar, Craic House, Pub Upstairs, and Sunset Bar. For shopping, there are several souvenir shops on the island, especially around Bounty Beach. You can find some groceries and market stalls as well for some of your needs. There are no banks or ATMs in Malapascua. The only feasible option is to withdraw first in Cebu City before your trip. Airfare from Manila to Cebu could go as low as PHP 2,000.00 to as high as PHP 8,000.00 for a roundtrip journey. Ferry rides are cheaper (around PHP 200.00 to PHP 1,000.00, depending on the point of origin). When going around the island, habal-habal fares start at PHP 20.00 per ride. You can also rent a motorcycle for the day for PHP 200.00 per hour. At Ging-Ging’s, you can already enjoy a meal with a budget of PHP 60.00 to PHP 100.00. Expect to spend more at upscale restaurants. At Amihan, for example, the entrees are priced around PHP 300.00 to PHP 500.00. Key chains, ref magnets, and pens are sold at PHP 20.00 to PHP 50.00 apiece at souvenir shops around the island. You can also grab a souvenir shirt for PHP 200.00 or more, depending on the design and quality. On the island, basic rooms can go for as low as PHP 500.00 a night. Rooms with more amenities and services, on the other hand, can go for as much as PHP 4,000.00 a night. For diving, the standard rate is somewhere between PHP 1,500.00 to PHP 2,000.00, inclusive of the equipment rental. While tipping in restaurants is no longer necessary especially if your bill already includes a service charge, a small amount of PHP 20.00 or PHP 50.00 should be ok.